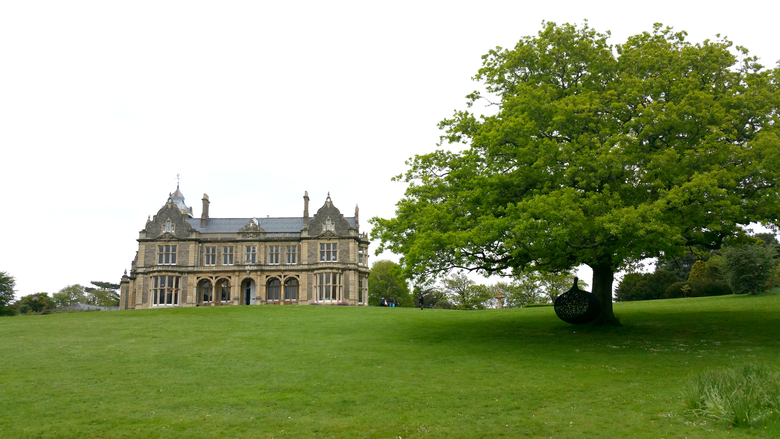 Last weekend Shehzad and I travelled over to the small town of Clevedon in North Somerset for an overnight stay at Clevedon Hall Venue. 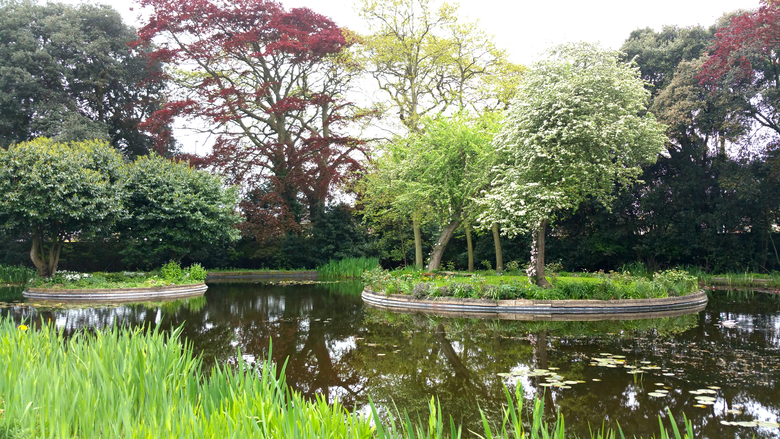 It sits just next to the sea in a green garden estate with picturesque fountain and private lake. 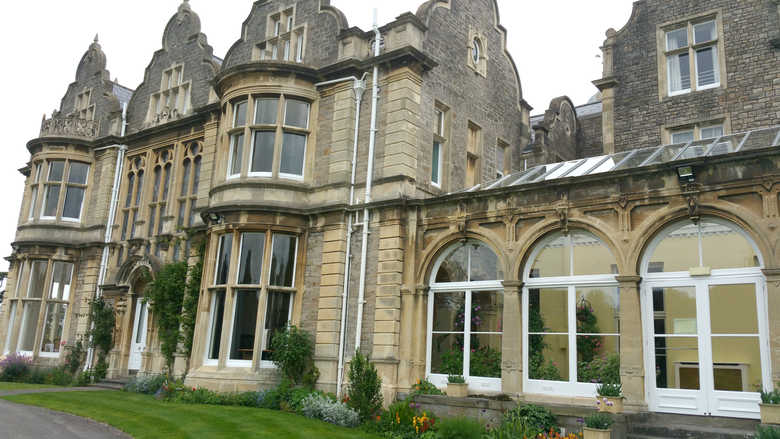 A 150-year-old manor, Clevedon Hall has previously been a home to it’s original owner, a school and even a call centre but recently opened its doors to events and weddings. The Great Hall set on the ground floor is Grade II listed with the stained glass, large wooden doors, curved bay windows overlooking the grounds and lake; you can understand why the owners decided to give couples the opportunity to Wed in this picturesque location. 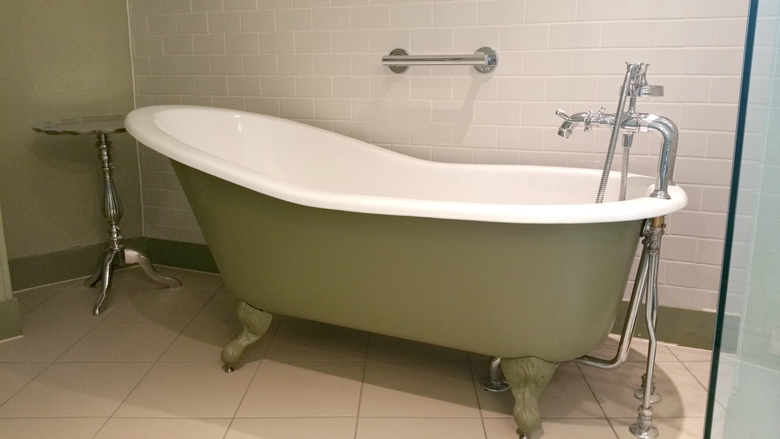 Across the First and Second floor are 25 bedrooms and suites, all recently refurbished to impressive standards, with each room and their en-suites individually designed with Vintage meets Modern furnishings. We entered our room, Merlin, on the second floor. 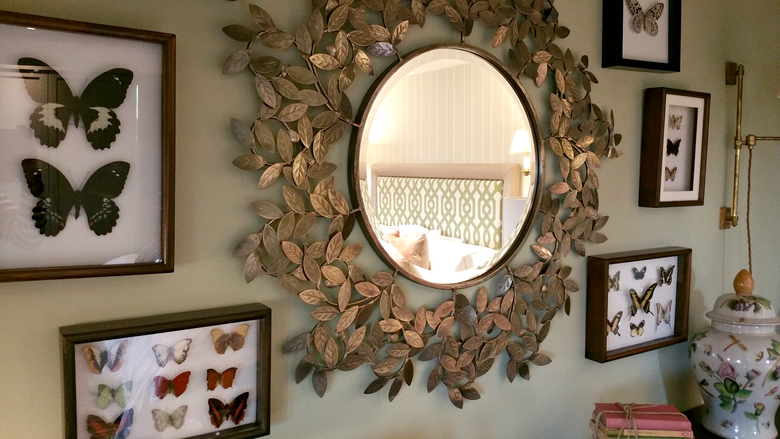 An absolutely stunning green and pink bedroom furnished with Butterflies and floral features, how did they know I love Butterflies?! The room windows overlooked the fountain outside, such peaceful views. 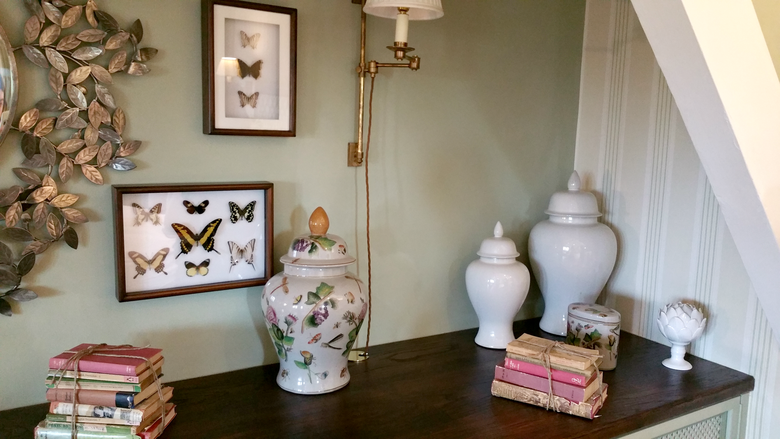 The effort that has gone into creating such perfect rooms can clearly be seen, everything from the colour of the room to the vintage books tied together with twine make the room just so complete. 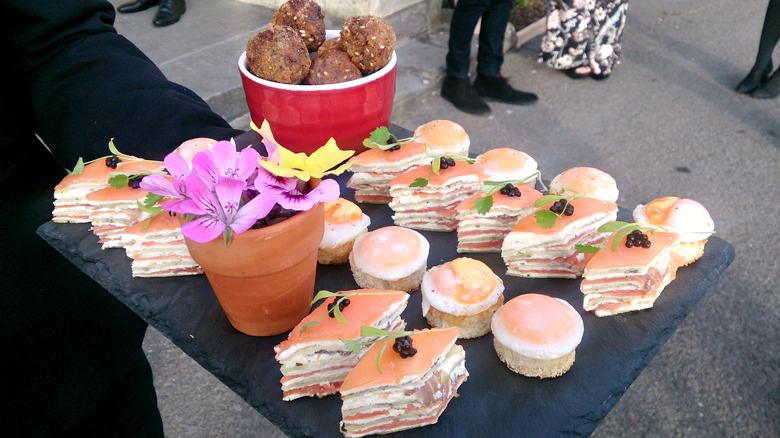 At 7pm we made our way down to The Great Hall for a drinks reception and canapes of Smoked Salmon Mille-Feuille, Truffled Quail Eggs and Duck Hoisin Beignets. Some seriously delicious and delicate canapes! 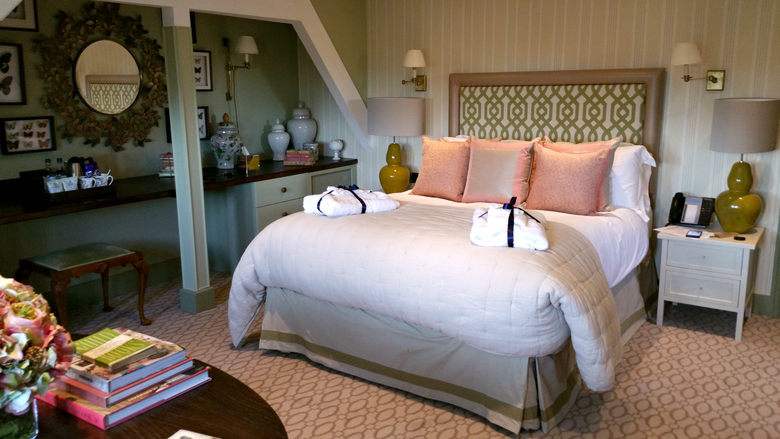 After getting to know the other bloggers and writers we were given the opportunity to take a look at two of the larger suites on offer at Clevedon Hall. Used for event stays, bridal suites and by highly established business persons, the suites have been decorated to such high standards, with plush queen sized bed, ensuite wet room and separate business/dining room. 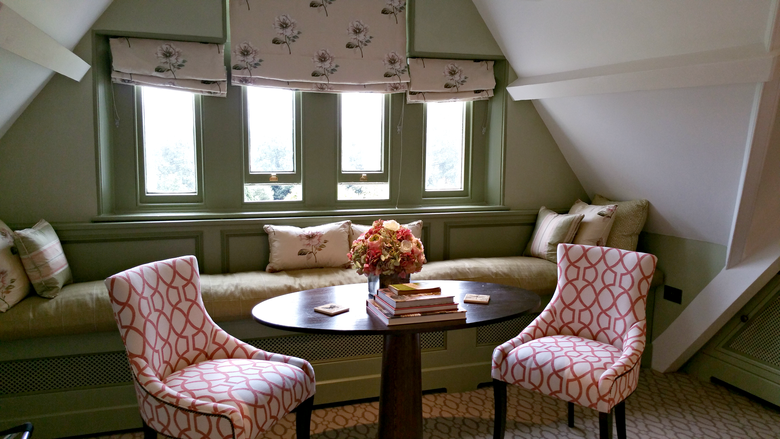 Meaning even the most private of people can stay in these suites without ever having to leave. By 8pm we walked through a large set of doors to the Grand Library, honestly it was like something from Beauty and The Beast. All the books set in the walls giving a classic setting, but don’t let them fool you – most of them are fake and just for effect. Now for the food. A 4 course meal created by head chef Alan Jones.  Alan is an award winning chef, has worked with some of the UK’s top Michelin-starred culinarians and was former finalist of the Gordon Ramsay Scholarship Award and South West Chef of the Year. Needless to say we were very excited to try the menu he set for the evening. 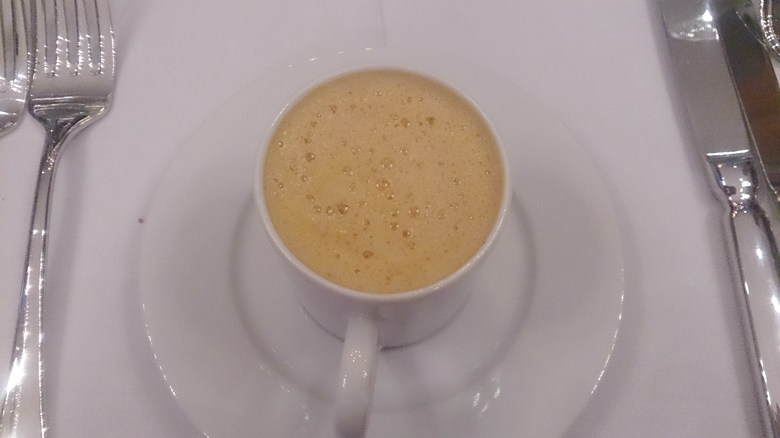 First, a Lobster Bisque with Cognac and Tarragon. A light yet powerful bisque, creamy and delicious served with freshly baked breads and churned butter. 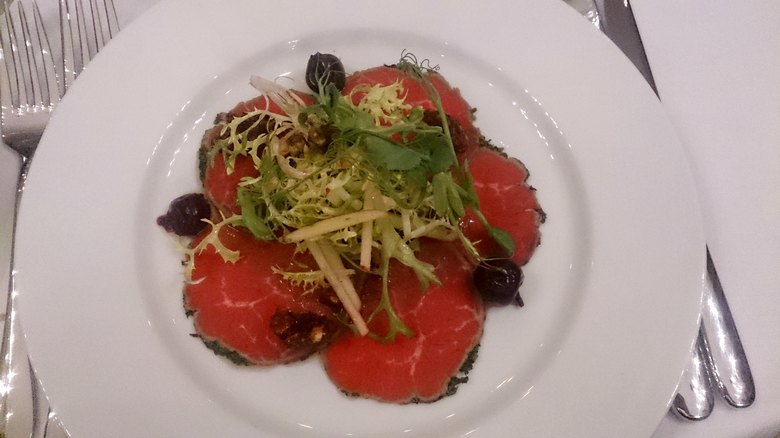 For starter, Carpaccio of Beef with poached cherries, candied walnuts and apple salad. The beef melted in the mouth, and was complimented perfectly with the apple salad and oh my gosh, were the candied walnuts perfect. 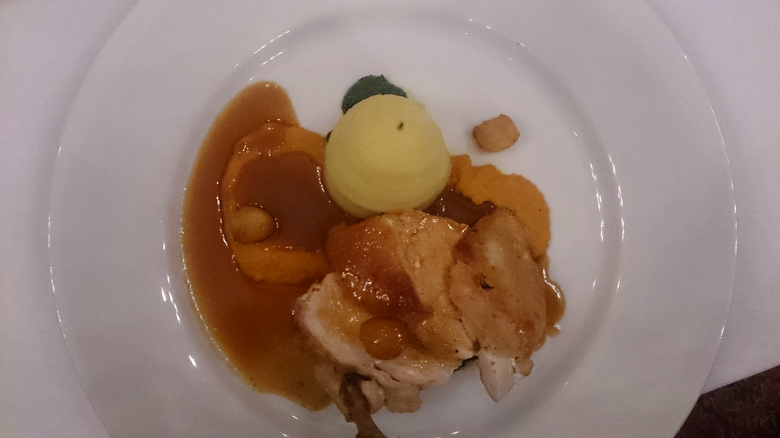 Next was a delicious main of Roast chicken breast, caramalized apples and wild garlic puree, creamed potatoes and spiced jus. The other guests had belly of pork but obviously I don’t eat pork. The chicken was delicious, moist and cooked to perfection. The caramalized apples give a sweet bite and wow, the wild garlic puree was out of this world. I’m going to have to try wild garlic more often. And finally a dessert of Vanilla set cream, raspberry jelly with poached rhubarb, rhubard and Champagne chilled soup and topped with a candied Rhubarb piece. 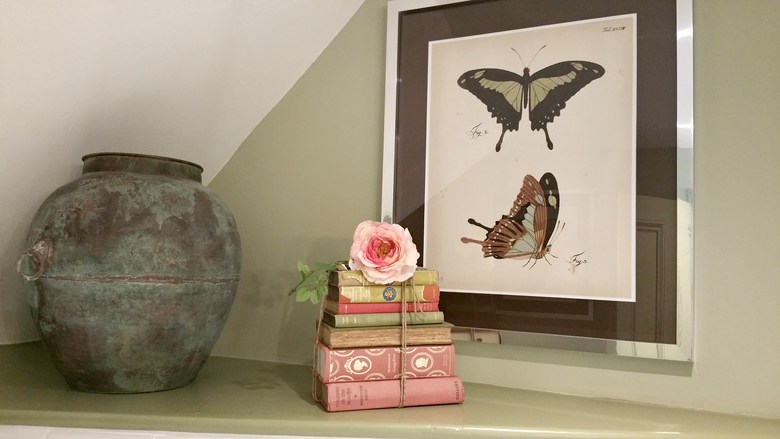 I am a huge rhubarb fan, when living in Cornwall I even had my own grown rhubarb. 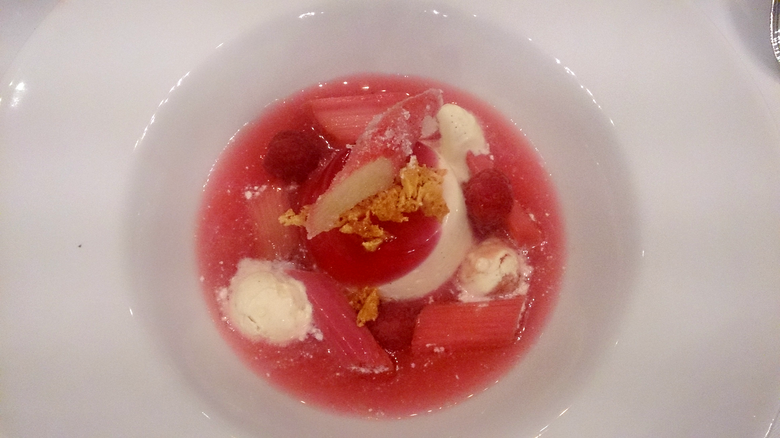 The set cream and raspberry jelly went beautifully with the stewed rhubarb. The Champagne soup gave a sweet tarte after-taste which was a delight. We were left, bellies full and feeling oh so pleased with our meal. But the drinks were still flowing and so we sat and chatted to John, one of the owners who transformed it into it’s beauty that stands today. 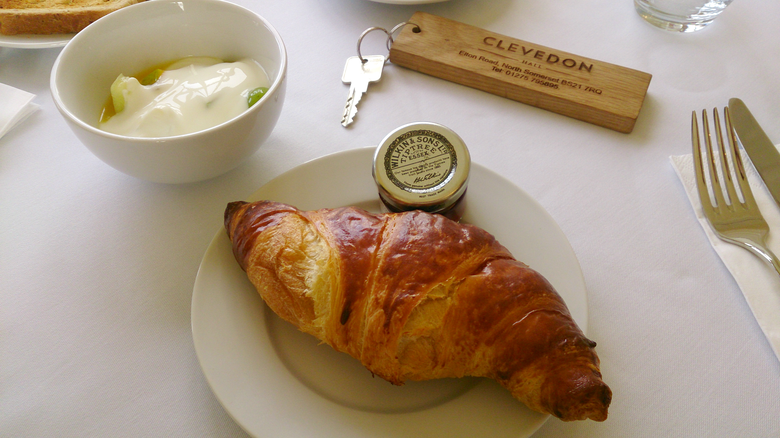 John told us about the history of Clevedon Hall and it’s plans for the future including adding a hotel and restaurant. As a soon to wed couple Shehzad and I cannot help but talk weddings, John discussed with us the process the team at Clevedon Hall go through to perfect a couples special day. 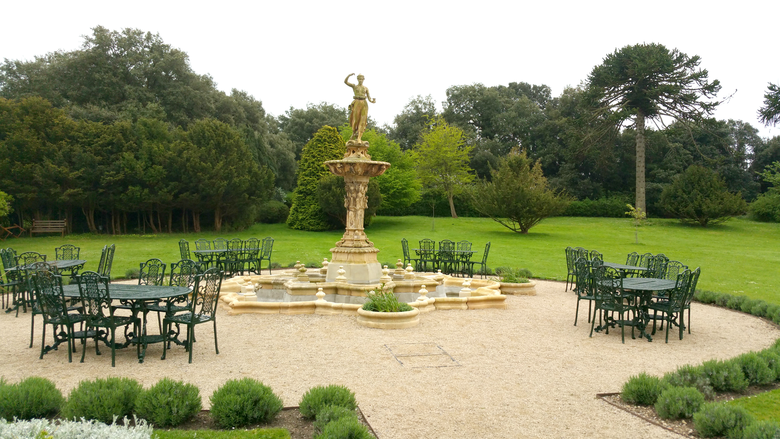 Everything from creating the perfect setting for their ceremony, which can be held in a number of locations from the Great Hall, with the sweeping staircase as the perfect entrance for the bride; to the Dame Rosa Burden, a large light and airy room with stunning views of the garden and lake. John even discussed with us the catering for weddings. There are no set menus for couples to choose from, instead the chefs are fully flexible catering to whatever your heart desires for your special day. This won me over, I wish more venues (especially those closers to where we live) catered with these guidelines! 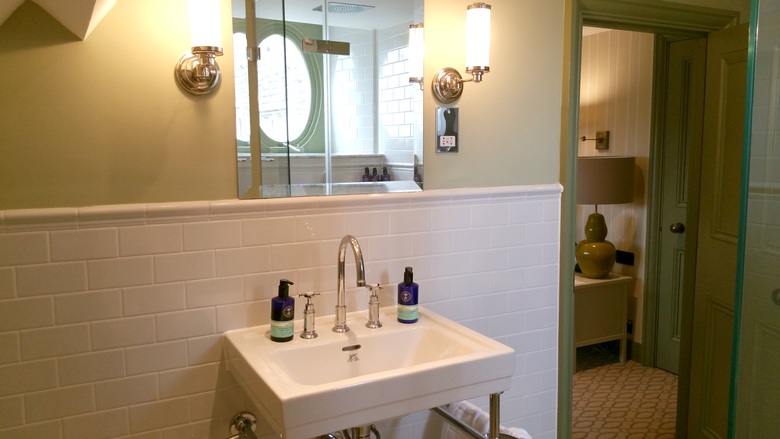 After a very restful nights sleep we woke, showered and dressed and made our way to breakfast in the Dame Rosa Burden room, where an array of options were available. From a full fry to freshly baked warm pastries and bread, and fresh fruits. The husband-to-be and I left feeling warm and very pleased with our stay. 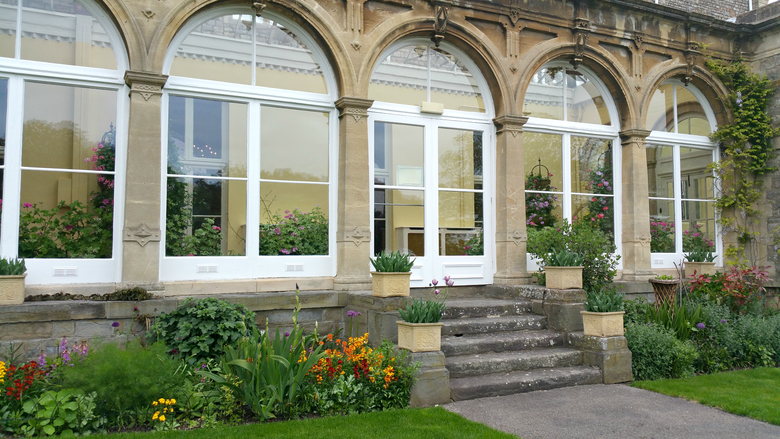 You can see the effort that has gone into making Clevedon Hall the venue that it is today. Any couple would be more than delighted to tie the knot in this stunning location. 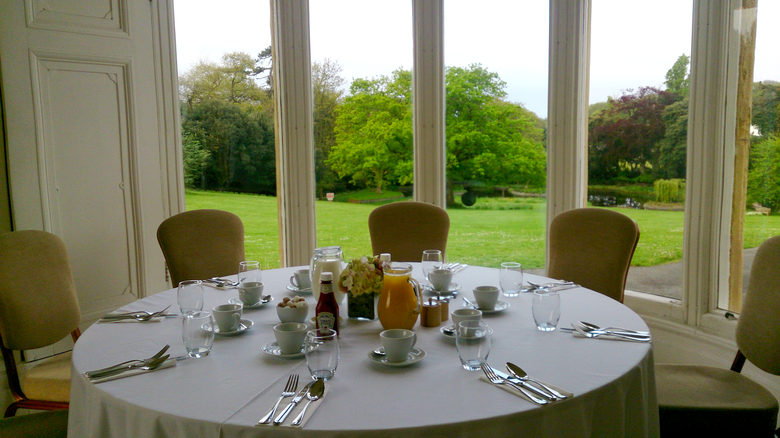 Clevedon Hall is available for exclusive hire for events, weddings or any formal occasion. 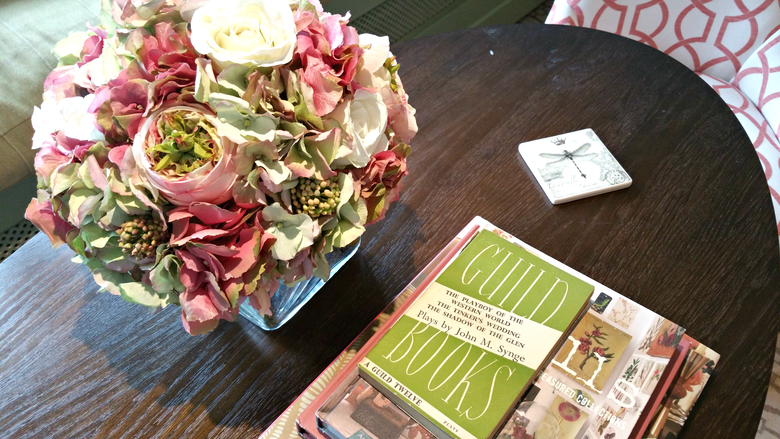 For more information and brochures do contact Clevedon Hall via their website. Oh I am definitely adding this to the bucket list – looks absolutely gorgeous! 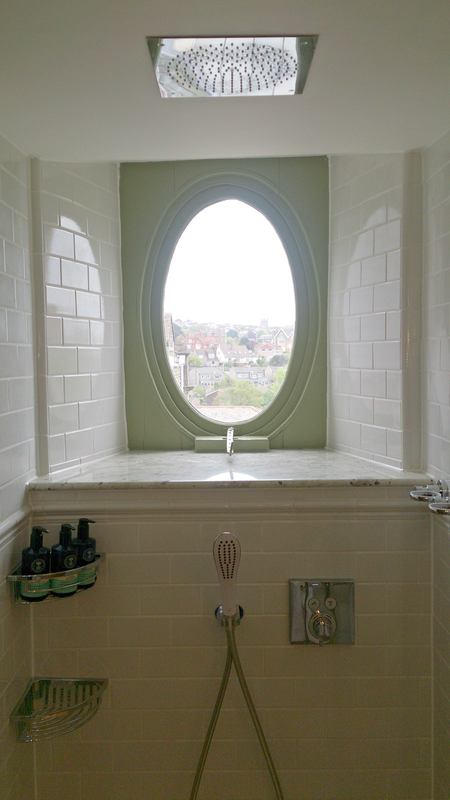 Especially the bathroom – I have a weird fixation with amazing bathrooms and that one looks fantastic. This place looks divine! 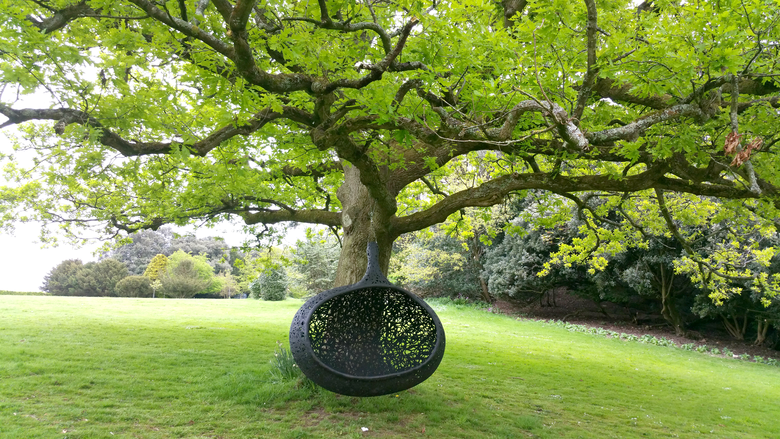 I’m loving the tree with sit/swing could just sit in that all day! Wow that looks absolutely beautiful!! 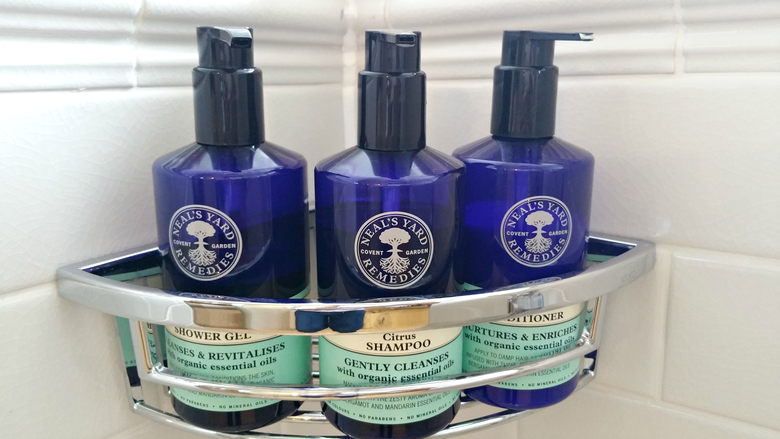 I love a roll top bath, that combined with the neals yard toiletries has be sold!